Ashley and Kyle have been in front of my camera many times. It all started with their wedding, and then evolved to maternity pics, baby pics, family pics, more maternity, more baby…. and now we have a new set of family photos. 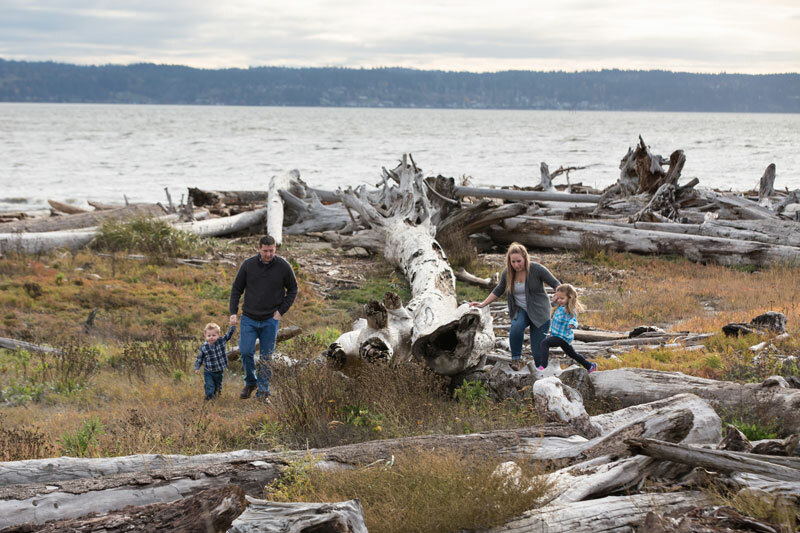 We took advantage of a blustery but dry weekend this fall to head out to Iverson beach on Camano Island. The sky was lit up beautifully with the perfect amount of clouds. We got some amazing photos before the kids had clearly had enough of the wind and cold. So – we packed everyone up and headed back to their house to warm up. After some fruit snacks and a bit of play time, we headed back out to their gorgeously wooded back yard for round 2 – this time with lovely fall color splashed in the background. It’s so fun to get to document a family as it grows over the years – and I have to say I think this is my new favorite session (and not just because we finally got the kiddo with resting-serious-face to start giggling).